A key ally of India's Congress Party-led governing coalition has suffered a major electoral defeat in the troubled northern state of Bihar. 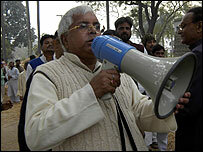 The Rashtriya Janata Dal (RJD) party of Laloo Prasad Yadav has been driven from power in his home state after 15 years. An alliance of the Janata Dal (United) and the Hindu nationalist BJP is ahead in over 140 of the state's 243 seats. Nitish Kumar, who is set to be the new chief minister, said it was a victory for people who had voted for change. Mr Yadav, currently federal railways minister, said he would help the new government in the state, which is among India's poorest and most lawless. The RJD-Congress party alliance is trailing well behind in the elections. Final results are due later on Tuesday. The BBC's Sanjeev Srivastava in Delhi says the Bihar result is an embarrassment for India's governing coalition. He says a rejuvenated opposition will make the most of their win following its shock defeat in last year's general election. Mr Yadav is one of the country's most popular and colourful politicians and is allied with the Congress party in India's national parliament. He ruled Bihar as his personal fiefdom, backed by a majority of the state's poor as well as low-caste Hindus and the minority Muslim community, our correspondent says. Mr Yadav is known for his quirky style, making the most of his humble origins and mass appeal. But he is also accused of corruption by his opponents. He has been charged with embezzling millions of dollars in a long-running corruption case. While many other parts of India have prospered in an economic boom, Bihar has become synonymous with poverty and backwardness. Many investors have pulled out of the state. Elections in February resulted in a hung assembly, which later led to federal rule being imposed. A new staggered four-stage poll took place in October and November. 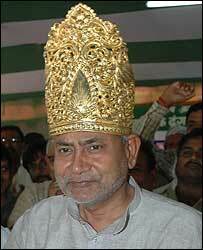 Mr Kumar, a former federal minister, said people in Bihar had voted for development and good governance. "They wanted a change and they voted for a change," he told reporters in Delhi.